All the winter holidays hold one thing in common: a celebration of light. It makes sense, really. During the coldest, darkest time of year, here come the holidays, with their Diwali lamps, menorahs, and Yule logs, to set our hearts aglow. Let’s be honest: for those of us nursing a recent (or even not-so-recent) heartbreak, the holidays can be an emotional minefield. Four months ago, my wife and I separated. Usually, at this time of year, we would be designing our family’s holiday cards and planning our annual party. Instead, I’m testing out self-care strategies to help me through this tender time. Anyone who has pulled an all-nighter fueled by Red Bull and Oreos (Anyone? Anyone?) knows how food can affect one’s mood. Even though I’m tempted to eat chocolate chip cookies for dinner on the nights my kids stay at their other mom’s house, I know I will feel better—physically and emotionally—if I give my body the nutrients it needs. Sleep deprivation messes with my brain chemistry, even after just a couple nights of broken sleep. So, no matter how deep the urge to check one more item off my to-do list (or, you know, watch one more episode of Transparent), I’m adamant about getting the sleep I need. Anticipating that cold + dark = lonely, I have promised myself I will not be cold this winter. Drinking hot tea, bundling up in a favorite hoodie, sleeping with an extra blanket (or three)—these actions send my psyche the message that even during the darkest, coldest months, I am warm, cared for, and loved. Whenever I feel stuck in a problem, I find the nearest steep hill and hike up it. Something about pushing my body’s limits—it grounds me in the moment, releases me from useless thinking, and leaves me with a fresh perspective on life. In her book My Stroke of Insight, brain scientist Jill Bolte Taylor shares a surprising fact about the physiology of emotional responses: they last 90 seconds. So as the holidays approach, with their many emotional triggers, I’ve been experimenting with the 90-second rule. When I notice big feelings rising up, I let them. Guess what? It doesn’t remain for very long. It does shift and change. I believe love lives not only in the particular relationships I have with particular people, but everywhere. I believe love is like the air that surrounds us. All I need to do is breathe it in. And thank goodness (note: I did not say “thank goddess”) I believe that, because on nights that could otherwise feel unbearably lonely, I have an endless supply of love, just waiting for me. If so many major religions agree on it, maybe there’s something to this whole “celebrate light in winter” thing? This much I know is true: I need more light, literally and figuratively. 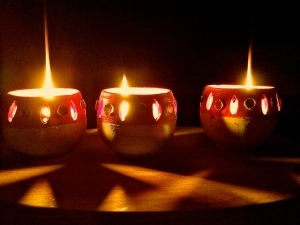 Their warm glow, the way the flames flicker, moving shadows around the room—candles create a presence that invites reflection and meditation. Watching a candle burn, I imagine all the people throughout history who—long before electricity and S.A.D. 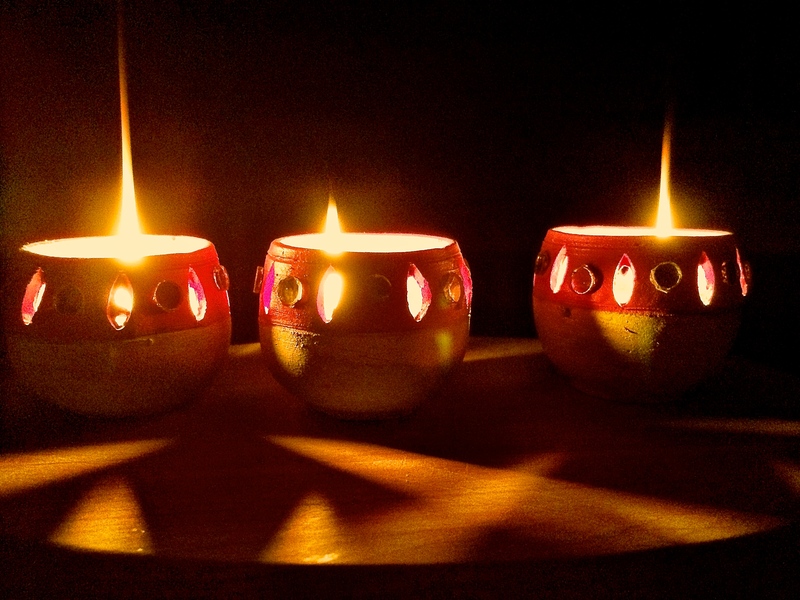 happy lights—lit fires to ward off winter’s dark. Watching a candle burn, I call to mind the winter holidays’ messages about resilience, triumph, faith, and renewal. Slowly, I begin to feel less like a single person nursing a private heartbreak and more like I am part of a larger, collective effort to lean toward love, light, and hope. Thanks for this. I feel like I should print it and hang it in the bathroom. Also, have your made kale chips? Yum. (Kale + olive oil + sea salt and bake). I am totally losing the “reply” game. See below for my reply (that is actually a comment) and my revision to the reply (that is actually a reply to my comment that was supposed to be a reply). Guess who did NOT follow tip #2 last night? I love kale chips! (Of course.) I used to make them with brewers yeast, to add a cheesy flavor, but my kids hated the smell so that got banned. this is so beautifully written. I’m sorry. This is so wonderful . . . I’m sending it to everybody. There are all kinds of reasons for dreading the holidays. I know this advice will help us all. Thank you for sharing it. Number 5 – Science IS rad! And so are you!! Fantastic, useful tips that I have shared and that I will use myself to get through the dark, cold days of winter. This was a beautifully written post. Thank you for sharing such important ways to be kind to ourselves and how important self-care is. I shared on one of my FB pages to help spread the word.